Blogging is quickly becoming one of the most effective online marketing tools for business. When it comes to marketing, blogging is one of the best platforms for content marketing. As consumers are reading blogs more often, the influence of blogs in decision making is growing. 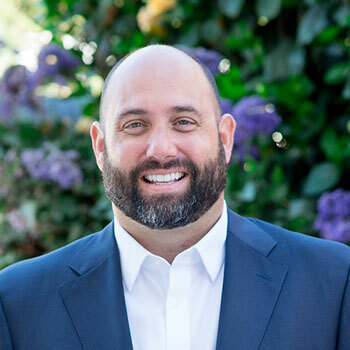 Writing a practice blog meets potential patients on a platform they are comfortable with and allows a practice to create trust with its audience. On the other hand, blogging benefits practice websites by increasing visibility in search engines, especially Google. 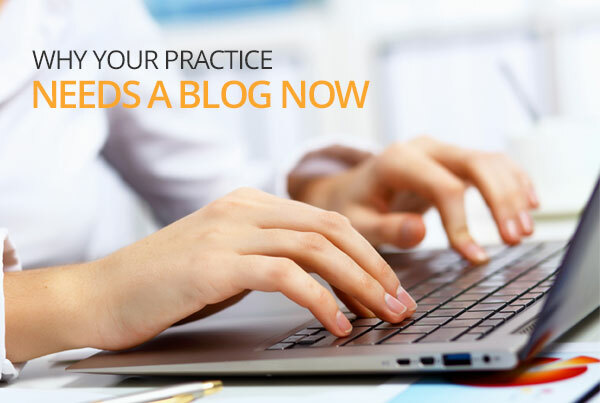 Read on to learn more about how blogging can help your practice. From our last post, you know that content marketing is the way to promote your practice. Think of blogs as the source of your content marketing and one of the best assets for your business. Blogs are “owned” media, you don’t pay to post content as compared to “paid” media like ads. Not to mention, blogging is a very cost effective way to generate leads, compared to paying for advertising. Also, consumers are reading blogs in greater numbers each year (see the eMarketer projection of blog readership for 2008-2013 below). 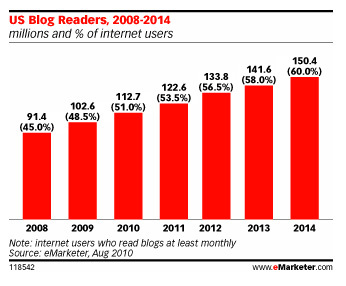 By next year, over half of Internet users in the US will be reading blogs monthly. For these reasons, blogging in business is growing, and according to the 2013 Social Media Marketing Industry Report, 66% of marketers plan to increase their use of blogs this year. The increase of business blogs is reflecting the growing influence of blogs on consumers. The blogging network BlogHer found 81% of US women trust the information and advice they get from blogs in it’s survey, “Women and Social Media 2012”. Blogging creates trust by establishing the authority of the brand by giving consumers free, quality information. Especially in healthcare, when a doctor is writing about questions patients have, sharing professional knowledge is invaluable. Because not every reader has the same background, blogs also present the opportunity to reach an audience at every part of the buying cycle. Creating trust and brand loyalty with your audience is going to create regular readers. Regular readers are more likely to complete a call to action which is how a blog will bring in leads, and ultimately, more patients. Blogs affect SEO through a number of variables including content, linking, author tags, and mobile compatibility. Google’s search algorithm rewards sites that provide fresh content over sites with stagnant content. Blogs (which are new pages of content) are a way to add fresh content that improves SEO of a practice site. Blogs with internal linking also strengthen the authority of your website and rankings. With carefully placed links to other pages – like procedure pages that already have a lot of traffic – you are telling the search engines that page is important, thus improving SEO. Blog post authors can be added to Google’s Authorship program, which increases CTR and establishes your authority as a content creator. Google is increasing the importance of G+ and authorship, and there are different opinions of how author tags affect SEO. Until we know more, we advise following the search giant’s instructions and implement Google Authorship on your blog; it can only help. 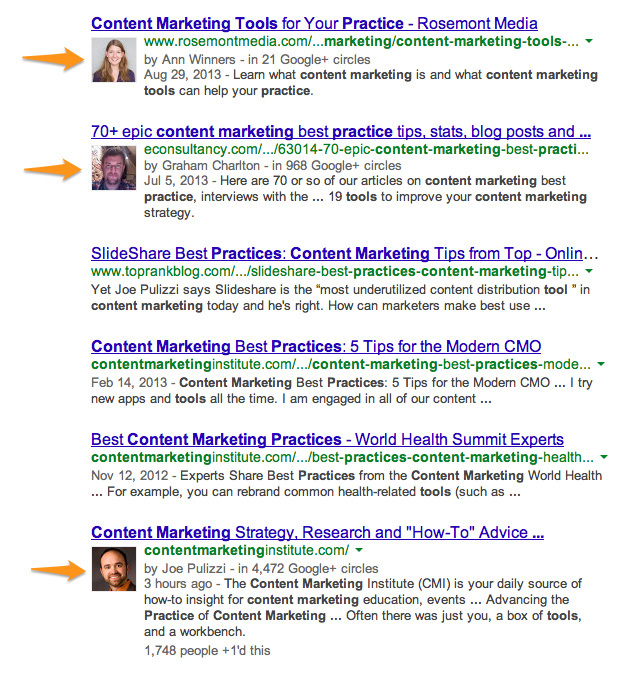 If you don’t know what Google Authorship is, read our introductory post, Author Tags: How Your Practice Can Benefit from One Photograph, and see the example search results below. Now that 15% of all web traffic comes from mobile devices, make sure your site is responsive. Now that more and more searches are done on mobile devices, Google is giving priority to mobile ready sites. No amount of blogging is going to help you reach that mobile traffic if your site isn’t responsive. Blogging also impacts stats including visitor traffic, time on site, and number of page views. 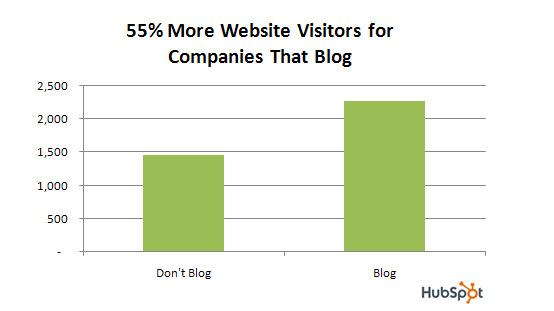 Hubspot found businesses that blog receive 55% more website visitors than businesses without a blog (see chart below). Given the additional website traffic from blogs, other website stats will improve. As your blog audience reads blog posts, time on site will increase. Before a blog, you might have had more volatile search traffic, but with a blog there’s a good chance bounce rate will decrease as people find content they were seeking. Page views will increase as well since posts with effective interlinking will encourage readers to click through to practice-related pages. Join the growing community of business blogs to increase leads and achieve better placement. Think of it this way, by not blogging you are missing out on reaching potential patients researching their cosmetic concerns. To get the resources you need to start your blog, contact us.